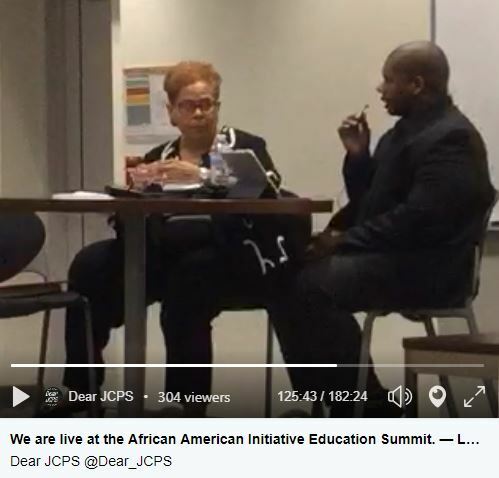 Watch the video of the guest speakers from Tuesday night’s @JCPSKY board of education meeting here. My name is Tiffany Dunn. I’m a national board certified ESL teacher at a wonderful school, Lassiter Middle. This was said twice for emphasis. JCPS parents, teachers, and stakeholders fought hard and made it clear we had no interest in being controlled by a privatization-minded, predatory state board of education and commissioner. We succeeded, but only to have our district wave the white flag anyway? What does “operating as if we are already under state control” look like, you ask? Our professional learning communities have been hijacked. We have district personnel sit in our meeting every single week. Instead of having collegial conversations about student learning, we are being forced to give common assessments. On the same day. No matter where we are in our teaching. And then analyze the contrived data as if it’s legitimate. We’re also being told we have to do project-based learning – the SAME project as our PLC members. Have any of you looked at the research on PBLs? It’s dismal. John Hattie has it at a .15 effect size – what does this mean? To be considered effective – a strategy should be at least .4. PBL effectiveness even falls behind charter and religious schools, which not surprisingly, weren’t much better. This type of control is not only attack on teacher autonomy, it’s an attack on student learning. Along with the classroom control, we have become obsessed with MAP testing and student data. We are losing precious class time to assess students. Most appalling is that ESL and ECE students are being denied their reader accommodation on the reading portion of the MAP test. So, these results aren’t even reliable or legitimate! Next Tuesday, our school is having a reward day for students based on MAP growth. We are losing two more class periods of instruction. Less than 1/3 of our 6th grade students qualified. Wayne and his cronies want nothing more than to see us fail – it fits their narrative and it will line their pockets. Following a takeover agenda will only get us one place – taken over. It was and always will be the end goal. Instead, JCPS needs to align itself with research-based strategies, not data mining. Teachers should be treated as the experts, not babysat by district and school administrators. I sure hope that teacher does not experience any retribution for speaking up for her students tonight. No teacher should ever experience negative consequences for doing what’s best for their students. And that includes our teachers who speak out against these threats of privatization and excessive testing and everything that goes along with it. My name is Gay Adelmann. 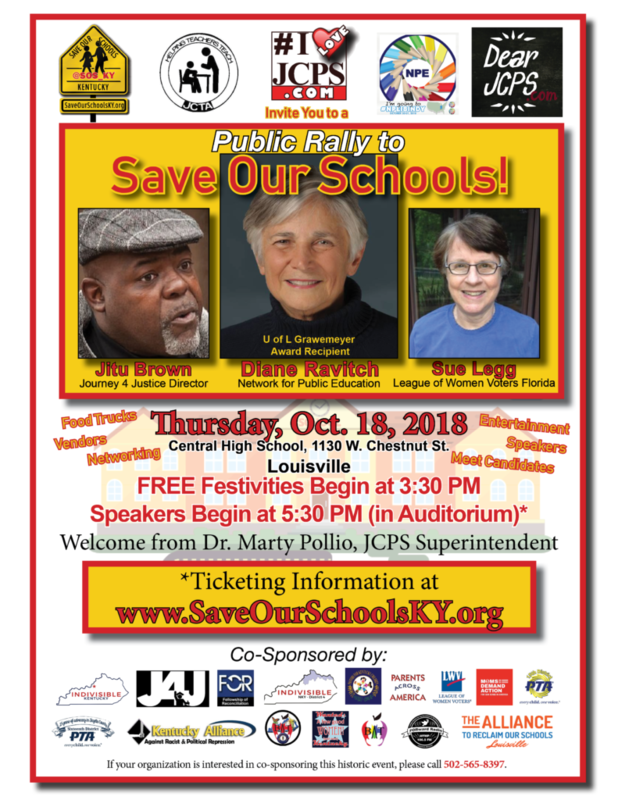 I am the co-founder of Dear JCPS and Save Our Schools KY. In May of 2016, I stood up here and told the current board chair he needed to put the interests of our students ahead of the interests of privatizers. He didn’t listen. And he’s gone now. In August of 2016, Dear JCPS cofounder Erin Korbylo stood here and told Dr. Hargens that we gave her a vote of no confidence because she worried more about what business leaders thought than about doing what was best for students. She’s also gone now. In fact, the first time I spoke to this board was in 2013. Before Dr. Pruitt was even the commissioner. Only two of you are still here. 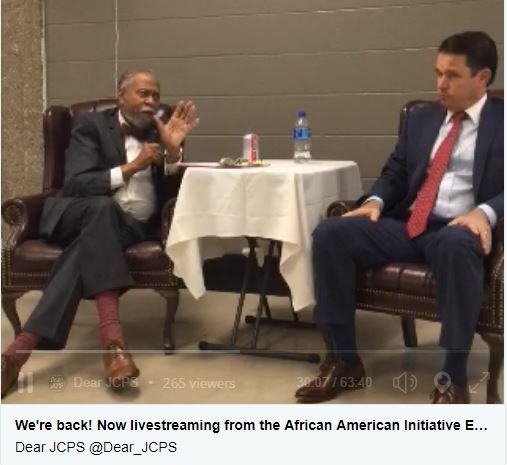 And here Wayne Lewis comes in from nowhere, telling you how to fix JCPS. And you jump through every hoop he sets for you. Don’t worry about them. The superintendent reports to this board, this board reports to us – the voters. Our students are your customers. The customer comes first. Not Frankfort, not business and chamber leaders (who probably don’t have kids in our schools), not these disingenuous Alec-funded fake grassroots groups. Because no matter what you do! It’s a shell game. It’s a moving target. They’re going to find a way to say our schools are failing. So you might as well do what you know is right. You’ve gotten a two year stay of execution. Use it. Spend it doing what’s best for students — especially our most vulnerable. Not jumping thru hoops for unqualified, outsiders with a privatization agenda. Here’s something I don’t think the community understands. What may be fine for mainstream students, like many of ours, is not fine for our most vulnerable. ESPECIALLY when you have a district of CHOICE! I did not realize this until I saw it first hand as a Shawnee parent. When you have choice and diversity, two things we TREASURE, you cannot allow them to use these qualities against us and destroy our district in the process. Fight back! Help them understand. Our most vulnerable students are the ones who end up being used as pawns to make the data look good for the adults. We know that these practices are abusive. They’ve told us! Resist doing what you know is harmful. Give exceptions – fight back – for schools with high needs populations. For vulnerable students. Because what works for the mainstream often throws our most vulnerable students under the bus. And we’re losing a generation of kids. If any elected official has a problem with our district cutting back on this state-mandated abuse, let them say so publicly. So we know who to vote out next time. Put students first. Not in aggregate. Not the averages. Not data points. Not the mainstream. All students, especially the most vulnerable. Support excellent teachers like Ms. Dunn. Allow her to do what she knows to be best for her students, and everything else will follow. Tiffany Dunn and Michael McCloud wait their turn to speak. We do not yet have a transcript of Michael McCloud’s speech but will post it here when we do. If you have a message you would like to submit to Dear JCPS, please email moderator@dearjcps.com. Click the images to play the videos. Listen to the Forward Radio 106.5 FM interview with Senator Neal and Dr. Pollio here. Public school advocates such as myself do not disagree that Kentucky is graduating some of its students with fewer skills than should be considered “college-ready.” However, adding more requirements to graduate, without adding resources and supports to ensure they can meet these goals, is tantamount to adding more thermometers to a patient’s care and expecting that to make them well. In fact, peers in other states tell us that this tactic has been implemented in their schools, not as a means to improve outcomes, but as a means to perpetuate the “failing schools” narrative, to justify further attempts to privatize public schools. Most students, like my son, had little difficulty meeting the requirements before, and would sail through these new standards as well. However, what is not being taken into account is the harmful effects they will have on our most vulnerable students. It’s already happening in our lowest performing schools, and these new requirements will only worsen their plight. Opportunities to “game the system,” and “teach to the test” will escalate, vulnerable students will continue to graduate unprepared and now they will lack the basic certification that allows them to gain real world experience, further feeding the pipeline to prison. Please delay this decision until you can visit a school like the one my son graduated from, and talk to impacted students, teachers and families. Instead of adding another means to measure what we already know, lets introduce more opportunities to intervene in the student’s academic career, EARLY AND OFTEN, so they are more likely to succeed. With the vote on new graduation requirements looming, several educational organizations and leaders have already named specific concerns with many aspects of the Kentucky Departments of Education’s proposal. The issues they’ve identified should be sufficient to at least pause the approval of the proposal. But, the debate has become one over details which often implies a concession to the main premise. In other words, the Titanic’s course may be approved because we’ve been focused on the deck chairs. Most agree that we need to find ways to help our students be better prepared for the next stage of life. However, we are not asking whether setting the minimum requirements for graduation is the appropriate place for this conversation. Minimum requirements should be achievable by all within our current system. A diploma should be work, but it only needs to show that a student has completed the minimal course work requirements, as our current system does. Colleges and employers all look at test scores, resumes, previous experiences, portfolios, recommendations, etc… in addition to a diploma. It’s neither necessary nor should a diploma have to carry the weight of having to certify that a child has preemptively completed the additional training, education, or development that may be required in the future. A diploma is a noble accomplishment, but it should not represent our highest expectations of education. In fact, it is a best counter-productive to set the policy and practice for reaching our highest goals though minimum requirements. When we do, we shift the burden that should belong to adults onto children. Figuring out what type of teaching and learning most engages and challenges our students, and then training and preparing educators to implement it is an adult problem. Creating learning experiences for students that are both personalized, but also equip them for a diverse world and an unknown future is an adult problem. Finding ways to stretch the teenage need for instant gratification towards long term decision making and investment is an adult problem. Marshalling the resources, funding, and connections to facilitate authentic workplace and research experiences for students is an adult problem. I know many hard working adults in education, and I think most would say that we are making progress on the problems above, but they are by no means solved. Our schools still don’t have sufficient or equitable access to resources. Our teachers don’t have access to the full training and support necessary to truly transform practice. Our policies aren’t always fair, up two 21st Century standards, or in the best interest of students. Solving these problems is the real work of raising expectations. Of course, children need some measure of responsibility and personal investment when it comes to their futures. But, the proposed graduation requirements takes this too far. We should never create a policy that holds children accountable for things adults should be working on. Pardon me while I rant! The recent news that the state is lowering its standards for teacher certification, no longer requiring a Master’s Degree, has put me over the edge. Besides the feeling of cheapening my degree, and those of my colleagues, this news comes just a few months after learning (with little or no warning) that the state will require all elementary art and music teachers to be certified to teach art and music. While this may sound like a good idea on the surface, it is in reality a ridiculously, poorly thought out, unrealistic, and unnecessary burden on our schools! 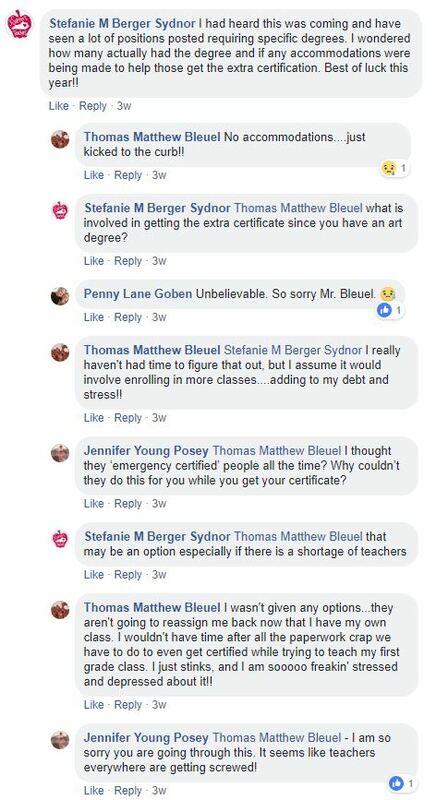 I am certified to teach k-5 (elementary education) reading, writing, math, science, social studies, etc., BUT, I am now….after teaching art and music at my school for 9 years….suddenly NOT certified to teach art or music!!? So guess who is teaching art and music at my school this year, as I was forced to move to 1st grade….NOBODY!! That’s right….my school, and several other JCPS schools, currently have substitutes filling these “VACANCIES”!!! So my students, who were looking forward to being in Art Club, or Percussion Ensemble, or Choir, get none of that, much less an experienced art and music teacher. There are simply not enough certified art and certified music teachers in Jefferson County to fill all the positions. Also, I was not given even a year to acquire this extra piece of paper that says I can do what I’ve been doing (and doing well, by most accounts) for the last nine years. Have I mentioned that my Bachelor’s Degree is in ART!!!??? I also have several years of music training under my belt (way more than math and science, I can say)!! So through no fault of my own, I must now figure out how to jump through all the ever-increasing paperwork hoops required of a regular classroom teacher (if the general public only knew how much time-consuming, bs, paperwork/computerwork teachers had to do….taking them away from doing things that would actually benefit students and instruction..). Meanwhile, the classroom I was fortunate to teach art and music in for 9 years, sits empty…waiting for the next sub to show up!! This rant is nearing its completion! 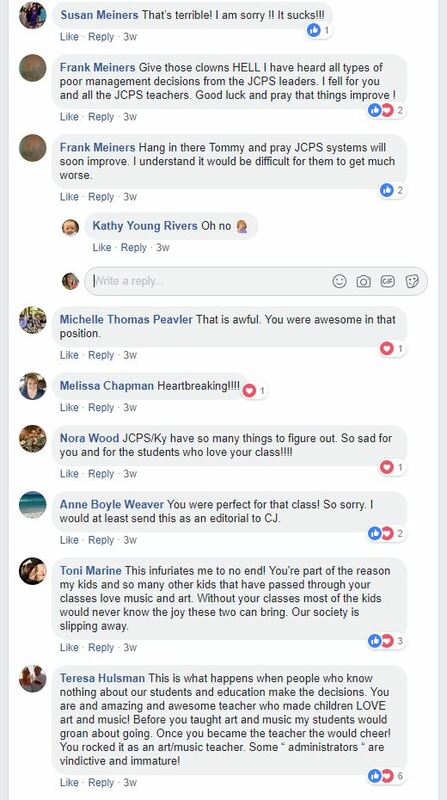 While a lot of this may sound like it is just me being upset about my situation….at the root of it is MY students, and the students of other JCPS schools, as well!! They deserve better!! Rant over….for now!! 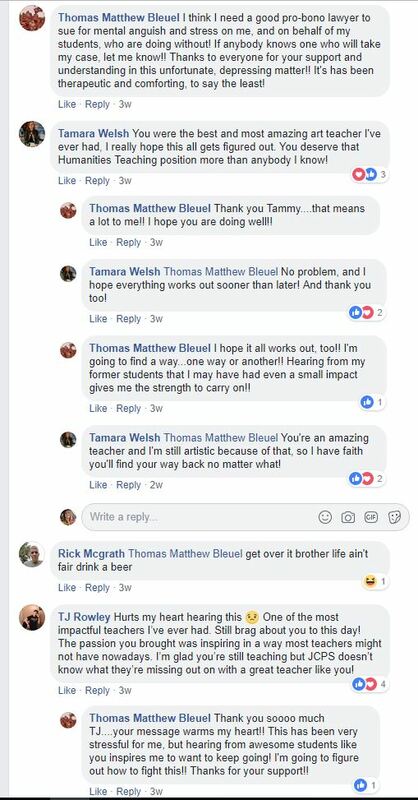 What follows next are the comments that were received on Thomas’ post. Clearly Jefferson County Public Schools is already feeling the effects of this short-sighted Koch-orchestrated maneuver. Combined now with the new exit exam to graduate high school that will be voted on Oct. 3, the “50% of schools now at risk of failing” narrative, the shady replacement of KBE members and commissioner, the attempted takeover of the state’s largest district, and the MYRIAD other hate-filled, ignorant comments from our governor, how can anyone NOT see that these OUT-OF-STATE GRIFTERS are playing from a playbook? It’s been executed in 45 other states, just look around us! Indiana, Tennessee, Ohio, Florida, Michigan, Arizona, YOU NAME IT, they’ve tried it, and many other states are seeing the light. WHY CAN’T WE? It’s time to wake up and stop this nonsense by voting pro public education on November 6. Read our Connect the Dots article to see all of the conflicts of interest we’ve uncovered, and we’re just scratching the surface! UPDATE: This rant was originally posted 3 weeks ago….the status is quo!! 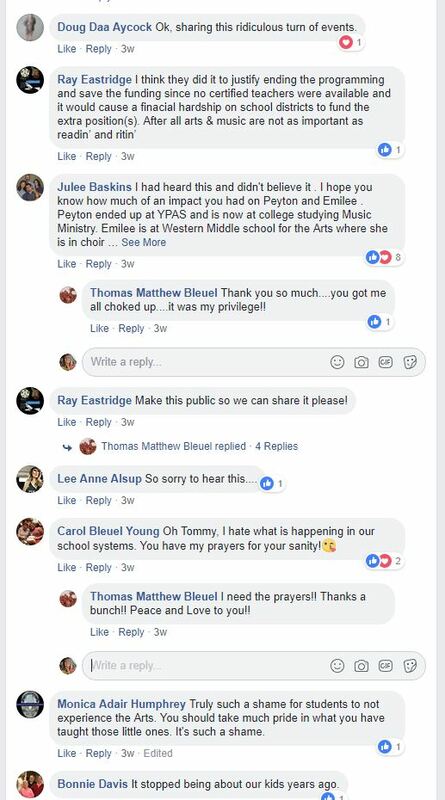 Nothing has changed, except the amount of quality art and music instructional time our students are currently missing out on due to this ridiculous turn of events! Do you know there are 6 junior class members that decide what vendor and price that the senior class has to pay for cap gowns? I’m upset because there are cheaper vendors. They offer school announcements, senior t-shirts, and when you purchase you can get your senior cap and gown for free. We are allowed to buy our rings from other places, why not caps and gowns? The views expressed here are those of the author. If you or someone you know has a concern, you are encouraged to submit a letter using our open letter form. NOTE: While the author’s identity is protected here, they are not anonymous to Dear JCPS. Any board member wishing to address the concerns shared here can contact our administrators to make a connection. Here are some of the things we will be talking about on today’s show (Sept 27, 2018). In the studio today, we have Karin Bennett and (hopefully) Ivonne Rovira. Our guest on the phone is Tyler Murphy. He’s running for school board in Fayette County. We will also be talking with Lassiter Middle School teacher Tiffany Dunn a little later on in the program. From the Playbook Whoops he did it again! Bevin doubles down on kids in harms’ way. State-wide tour last week before the election. How things are coming along. Thank you for joining us! A link to the program will be available on Sound Cloud later this week. I would like to address issues at Jeffersontown Elementary. The culture there is toxic and dysfunctional. The “adults” don’t trust each other or the administration, unless you are in the it club. The principal literally screams at parents who take questions to the board instead of asking her. Well, when you attempt to talk to the principal she NEVER looks up from her phone. She also sits out in the lobby/ main office area on Facebook or texting and ignoring parents who are coming into our building. Within the past 2 weeks we have lost our secretary and bookkeeper. I ask you with the front office completely leaving, the principal basically on her phone all day long and screaming at our parents. Why has the board not ask questions or investigated why the whole front office has had a turn over. Our attendance clerk also left over the summer due to drama. 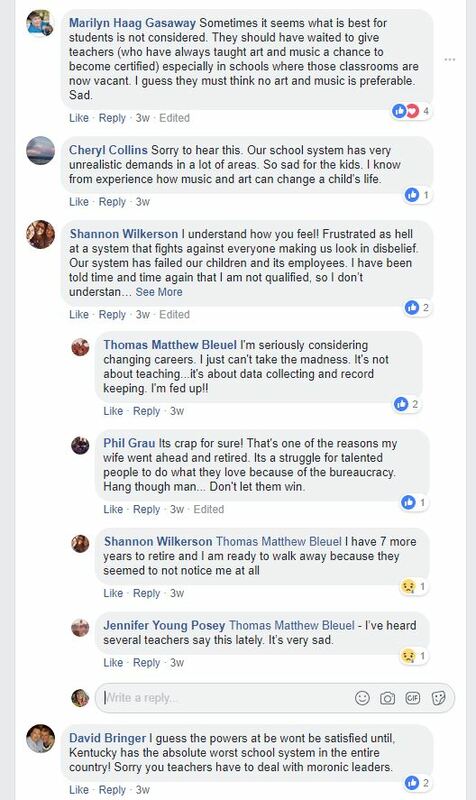 I’m more concerned that the board is practically ignoring the fact that we’ve lost an attendance Clerk and secretary and a bookkeeper within the past 2 months. I’m also very concerned that their culture there is so toxic that the students notice that teachers don’t speak to each other and the teachers don’t trust each other. I cannot condone or survive in a toxic dysfunctional culture which is what J-Town Elementary has now become. Which is very sad considering what an amazing reputation it had in the past. We are losing students it’s due to the lack of professionalism of the main leadership in the building. 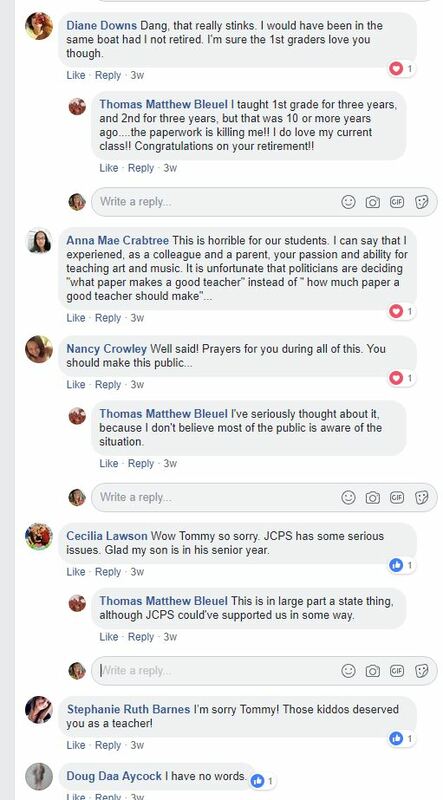 I honestly believe that Dr. Hooper or any one from Central office would be appalled if they could see what the true Jtown has become not the dog and pony show they put on when the visits are scheduled. Dr.Hooper because it was his school. I just want change. THANK YOU SO MUCH! !